How much do you know about talent brand? You know, the totally public version of your employer brand that encompasses what talent thinks, feels, and shares about your company as a place to work. 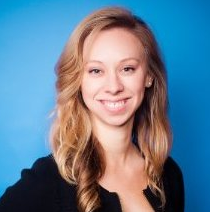 Are you familiar enough with talent brand to pitch your C-suite on its value? Or perhaps, just enough to nod in vague recollection when you hear the term on a conference call? No matter your level, here are 11 facts about talent brand that will empower you to better understand the impact and maybe even build the case for investment in talent brand. 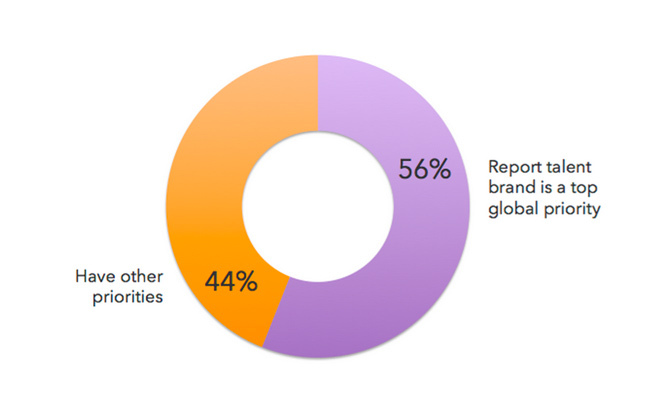 Our 2015 Global Recruiting Trends survey asked talent leaders about their biggest priorities in 2015, and it turns out 56 percent reported that building their employer brand is a top priority for their company. In the same survey, 75% of global talent acquisition leaders reported that talent brand has a “significant impact” on their ability to hire great talent. 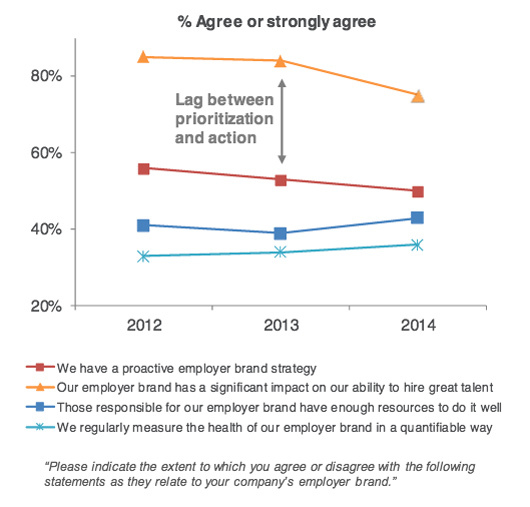 In this graph, the orange line shows that 75% of talent professionals agree or strongly agree that talent brand has a significant impact on their ability to hire great talent, as of last year. In 2012 and 2013, the majority was even greater. The best way companies can spread the word about their open positions is to leverage current employees and those employees’ personal and professional networks. Take advantage of this finding by training and empowering your employees to act as “brand ambassadors” for your company, sharing their experiences, open roles, and work highlights with their social networks. In our recent 2015 global Job Switchers survey, we found that 49% of professionals said their biggest obstacle when changing jobs is not knowing what it’s like to work at the company. By building your talent brand, along with every employee at your company, you’ll help job seekers feel informed—and even excited about—your company culture and values. 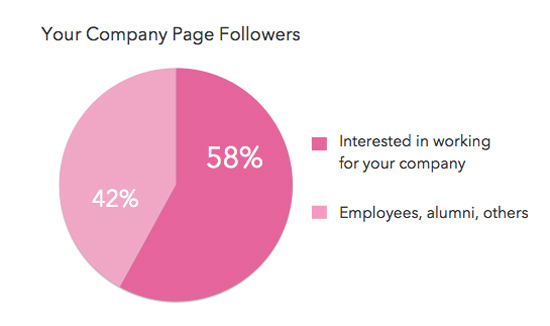 Are you sharing content and reaching out to your followers to get them in your recruiting pipeline? It's easier to start a conversation with someone who knows a few things about you than with a complete stranger. The same logic applies to recruiting. By increasing awareness of your company with your talent brand, you should see a higher InMail response rate. Your InMail recipients are more likely to already trust you as an employer and will have a better sense of whether they want to work with you. We analyzed the average InMail response rate of companies with a strong talent brand on LinkedIn vs. companies with a weak talent brand on LinkedIn. 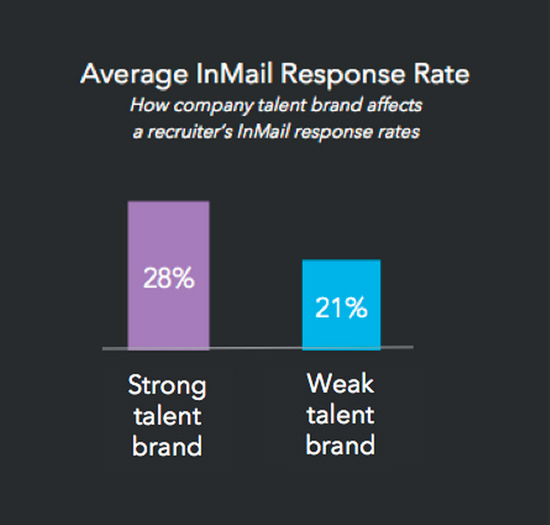 We found that a strong talent brand increases your InMail response rate by 25%. 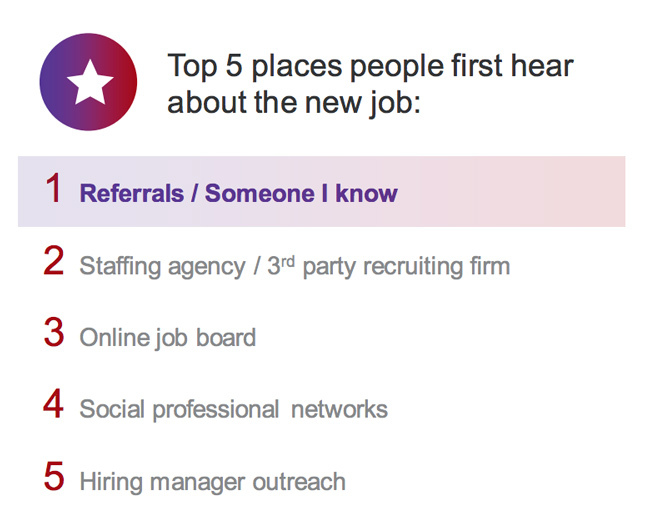 The more professionals know, and like, your company, the more likely they are to become applicants. 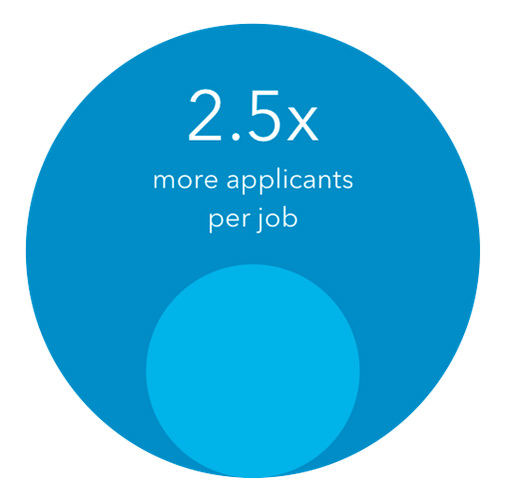 In the same analysis, we also found that companies with a strong talent brand on LinkedIn see, on average, 2.5x more applicants for a job posting than companies with a weak talent brand on LinkedIn. It just makes intuitive sense—the more comfortable a job seeker is with your company culture, the easier it is to imagine themselves there. We also found that companies with a strong talent brand on LinkedIn experience, on average, a 20% increase in their rate of hire (calculated by new hires / total hires in a given amount of time) than companies with a weak talent brand on LinkedIn. 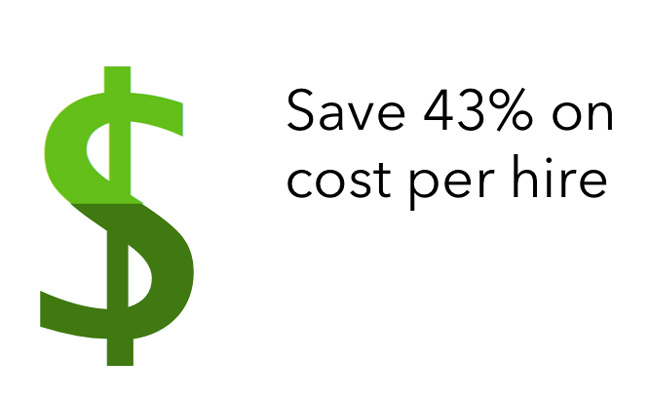 Not only does a strong talent brand help you hire faster, it also helps you reduce your average cost per hire. We found that our customers with a strong talent brand spend, on average, 43% less to make a hire on LinkedIn than our customers with a weaker brand. The stronger your talent brand on LinkedIn, the less you need to spend on LinkedIn to make a hire. 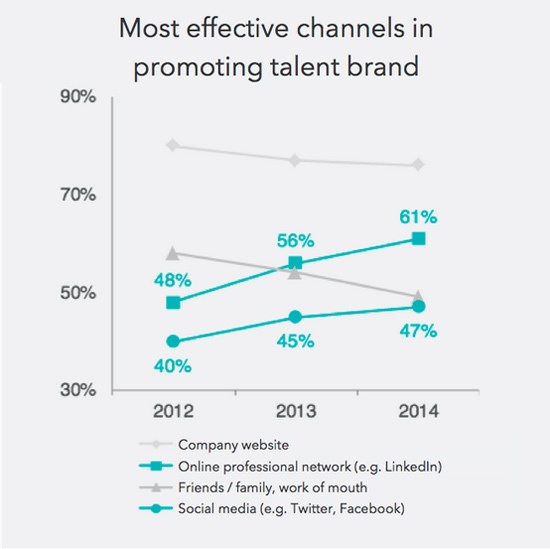 Since we began tracking this data in 2012, social professional networks (LinkedIn) have grown in popularity as the main channel companies use to promote their talent brands. Our 2015 Global Recruiting Trends survey found that 61% of talent leaders use social professional networks to grow their brand. 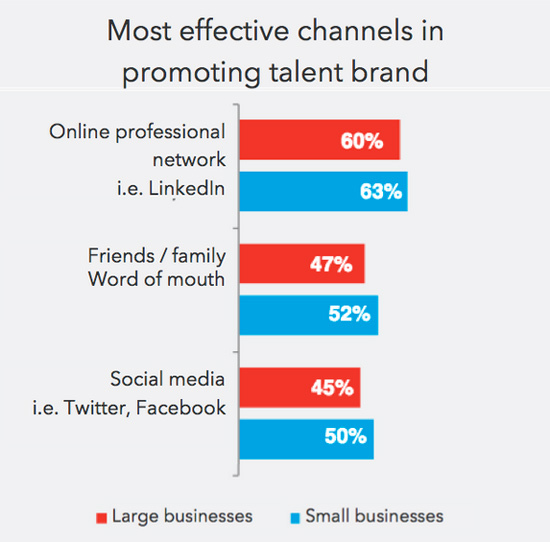 60% of “large businesses” and 63% of small to mid-size businesses report using online professional networks as the primary channel to build their talent brand.